Welcome to Lannan Chevrolet of Lowell’s Automotive Finance Center! 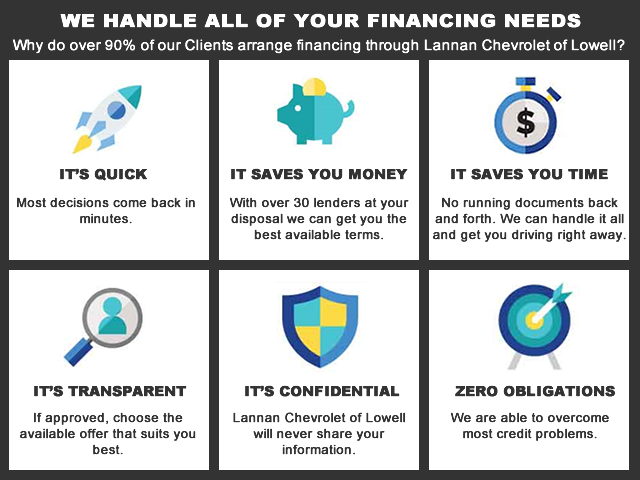 The Lannan Chevrolet financing department can help anyone find the loan they need. Whether you have good credit, bad credit, or no credit Lannan Chevrolet can find a way to get you off the lot today. At Lannan Chevrolet we work with the best in the business to get you into a car at the price you want. Make sure to stop by Lannan Chevrolet to see our expert finance team, we can help you with anything you may need. At Lannan Chevrolet we strive to provide a stress-free experience. Lannan Chevrolet is perfectly located and perfectly priced.